Docker provides us pluggable storage driver architecture. It gives us the flexibility to "plug in" the storage driver in our Docker. It is completely bases on the Linux filesystem. To implement, we must set driver at the docker daemon start time. The Docker daemon can only run one storage driver and all containers created by that daemon instance use the same storage driver. The following table contains the Docker storage driver. To check which storage driver is used by the daemon, we can use the following command. We can see that the above command shows the storage driver used by the daemon. The Backing Filesystem is extfs. The extfs means that the overlay storage driver is operating on the top of the filesystem. The backing filesystem refers to the filesystem that was used to create the Docker host's local storage area under /var/lib/docker directory. The following table contains storage drivers that must match the host?s backing filesystem. Note:- "Disabled on" means some storage drivers can not run over certain backing filesystem. We can set storage driver by setting its name to the dockerd command. The following command starts a daemon and set new driver. 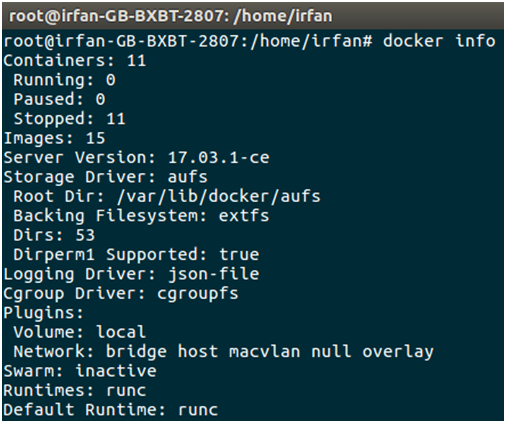 Later on, we can check docker driver by the following command.